Cathy Drew, executive director of the Ozark Gateway Tourist Council was inducted into the Arkansas Tourism Hall of Fame during a luncheon Monday, March 12, 2018, at the 44th Annual Governor’s Conference on Tourism. Upon receiving the award, we asked Cathy who has been instrumental in IMPACT Independence County planning and implementation efforts to reflect on her time with tourism in our region and receiving this award. When I received word from the Department of Parks and Tourism that they would induct me into the Arkansas Tourism Hall of Fame in March, this was a surprise but such an honor! The thought of being in a category with past tourism greats across the state and region was overwhelming. This caused my mind to travel back in time to when I worked in graphic design at The Media Market, Inc. - the region's ad agency formerly located in Batesville. I remember many days working long hours to create the region's old paper tabloid publication the old school way, during the Christmas season when stress was somewhat higher than normal. This entailed using the Compugraphic typesetting machine, a dark room and light tables for that fun paste-up process, and a simple page took hours to layout and finalize, that was a few years before the use of computers changed our pace. The hours spent producing publications like our Ozark Gateway Region tabloid was extensive but fun at the same time. Seeing the outcome of days preparing pages made us feel accomplished, especially when the finished product was in our hands. Working behind the scenes creating the region tabloids gave me a desire to take that experience to the next level. When Donna Baker, the previous region leader decided to end her career with Ozark Gateway Region, she approached me, and indicated she wanted me to be the future director after her planned retirement. I was somewhat nervous, but very optimistic, to continue my association with the Ozark Gateway Region. In 2000 the Ozark Gateway Region board made the decision to hire me and thus began my next career step in this tourism and relocation industry. I loved the opportunity to meet people across the region and, above all, the ability to tell them about our beautiful corner of the state that travelers love to visit. The first year as the region director inspired me to see the association advance to the next level. Preparation began to discuss the need for the region to change from the paper tabloid to a magazine format visitor guide, a huge jump for us. Our first magazine publication came out in 2002, and, as anticipated, was a hit with our members and those requesting one for their vacation planning. Today's technology profoundly changed our tourism business, from a slow pace time-consuming process to the fast paced world we live in now. It has been a fun adventure seeing the region advancement as well as the communities in it. Each of our eight counties has worked to advance their efforts in encouraging people to vacation in the area. Because of this diligent work, many times those visitors decided to make this their forever home. Seeing the communities such as Independence County embrace the desire to grow and offer more opportunities not only for those planning to vacation but for individuals that live here has been an amazing experience. I find it overwhelming to see how this community has prospered and I know it will continue to grow because we want to pass along a better hometown to our children and grandchildren. Yes, it is work, but isn't it worth it? Our children and grandchildren should be reason enough, and to think about others who will enjoy it in the years to come. We need to work towards creating a region with activities, attractions and natural beauty that leaves other places envious. 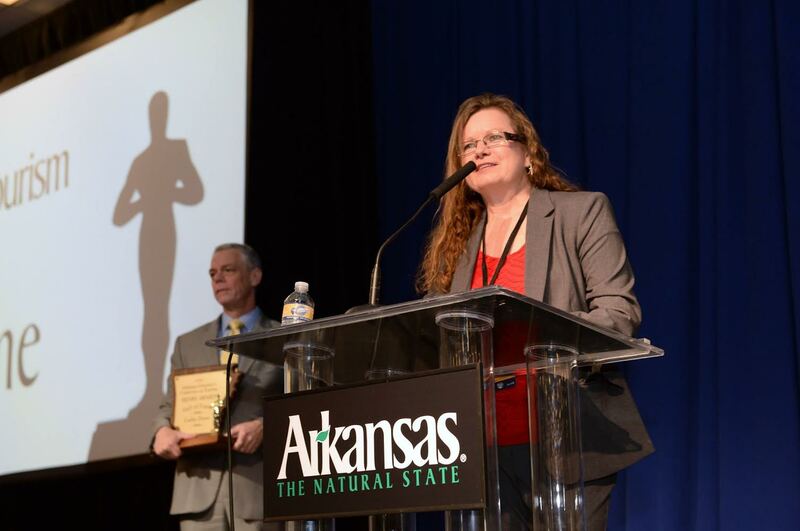 It was an exciting and wonderful honor to receive this award at the Arkansas Governor's Conference on Tourism. Walking upon the stage and having Governor Hutchinson and Miss Arkansas hand me that beautiful award and glancing at the crowd of leaders from across the state was amazing. All of the people in the audience have the same desire as I do, and to know we are all working together to see our beautiful state of Arkansas continue to thrive will lead us to a bright and successful future that we can each pass along to our offspring. I'm happy our future in the Ozark Gateway Region will be a better place than when we began our roles in this fun and ever changing industry. Let’s all keep up the diligent work, the future depends on it!